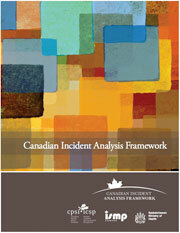 PDF: English | Français The Canadian Incident Analysis Framework provides a standardized approach to analyze critical incidents and near-miss events in healthcare. The framework was developed collaboratively by CPSI, the Institute for Safe Medication Practices Canada, Saskatchewan Health, Patients for Patient Safety Canada, and other individuals. This Framework is an analytic tool for performing a review of incidents, including but not limited to medication incidents, and identifies strategies for implementing system improvements through analysis of root causes and contributing factors. Effective incident analysis promotes a safe and just culture, and supports quality improvement initiatives to improve the care of patients and families. ISMP Canada provides educational workshops on incident analysis (e.g., root cause analysis, and multi-incident analysis). On-site workshops or facilitation of healthcare incident analyses can also be arranged. For more information, contact info@ismpcanada.ca or call 416-733-3131 / 1-866-544-7672 (toll free). ISMP Canada shares learning from incident analyses in the ISMP Canada Safety Bulletins, and SafeMedicationUse.ca newsletters for consumers.